Alma Lovett stepped out of the crowd and took the lead when drug crimes, violence, truancy, and lack of day care screamed for attention in her community – Memphis’ public housing projects. Mother of six children and herself a high school dropout, she moved into Fowler Homes public housing 16 years ago. Soon she founded the Fowler Homes Youth Club to organize, entertain, and motivate her young neighbors to make something of their lives. She was elected president of the City-Wide Memphis Housing Authority Resident Council five years ago. Outraged at what was happening to children in her world where murder and drug running can seem a way of life, she coalesced housing project tenants who marched on City Hall and drew police response for more patrols. She created and personally runs a free day care program that now tends 100 children. She attempted a program with school officials and Juvenile Court to keep children in school by targeting truants lingering near the housing projects and bodily taking them to class. Since her march on City Hall in October 1987, her car windows have been shattered and she has received threatening phone calls. But she carries on. 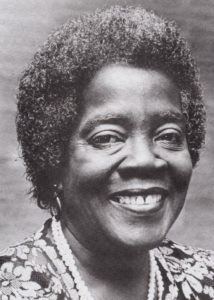 Alma eventually left public housing and worked as a manager of privately-owned apartments.